Happy Thanksgiving ‘Murica! From the wild turkeys at the Montreal Zoo Ecomuseum. 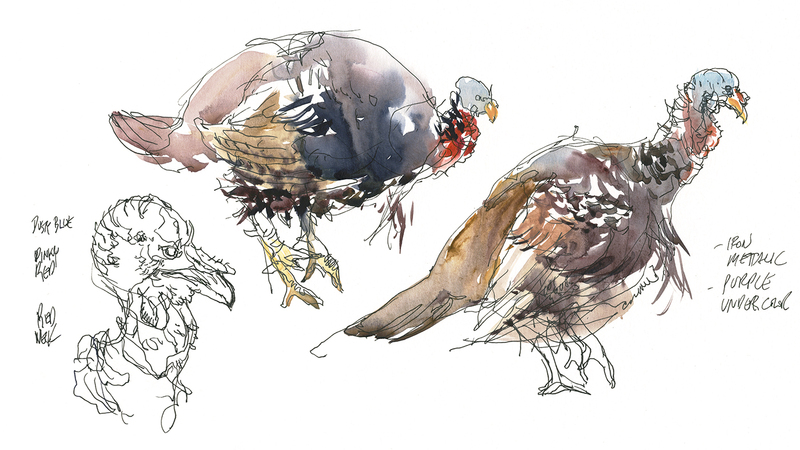 The turkeys at our particular zoo are quite tame, coming up to the fencing and hanging out with you, making them quite easy to draw. Unlike say, foxes, who hide in gullies and under logs and only pop up to dash across their enclosure. I was surprised to learn that not all red fox are red. Of the pair on hand this day one was the orangy red you’d expect, the other was black with silver tips, excepting the very end of his tail, which was a traditional pure-white fox tail. It’s getting late in the year to be outside sketching, I had five layers of coats and sweaters. The fox was so puffy with his winter coat he looked more like a badger. But he still did that pounce-straight-up-in-the-air which is so distinctive of foxes. 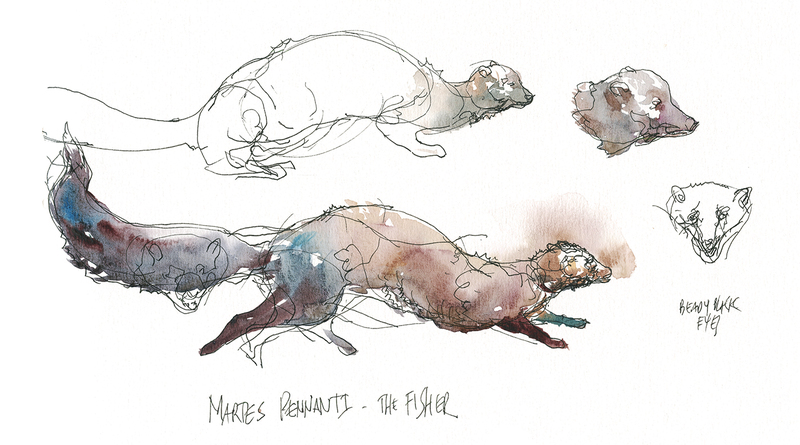 Naturally, when drawing animals the challenge is their constant motion. It seems, if you can see them, they’re moving. For sure, most of the time you can’t even find the animal in the cage. Or finally you see an unrecognizable ball of fur way up in a tree or in the back of a shelter. But the other common behavior, in everything from wolves, to big cats, to this fisher (in the weasel family but sometimes called a pekan or fisher cat) – is pacing. They run loops around the enclosure. Back and forth, around in circles, never stopping. Most of these animals have worn a path into the perimeter of their space. So, when sketching, it’s a matter of waiting on them. Working on a pose every time they loop by. I think you can see in fox above, and this fisher, that I’m starting the drawing with scribbles – just open lines and suggestions of contours – I’m doing a lot of guessing – until gradually committing to certain arc of spine or set of leg positions. That’s the key for me – just keep drawing right on top of the sketch. Your drawing might look hopeless with all these corrections. But as soon as you throw on color, it makes the final pose jump out, and all the searching lines become unimportant. I don’t mind leaving the sketching in. It’s just part of the the look of a spontaneous drawing. I do the same thing when drawing people from life. The name fisher by the way has nothing to do with fishing or eating fish. Wikipedia tells me it’s based on fitch, a name for the European polecat. Whereas the otter – definitely eats fish. We came by just in time see the keeper tossing in some silvery herrings, which were chomped down, bones and all, in about five minutes. Only leaving a tail stub behind. 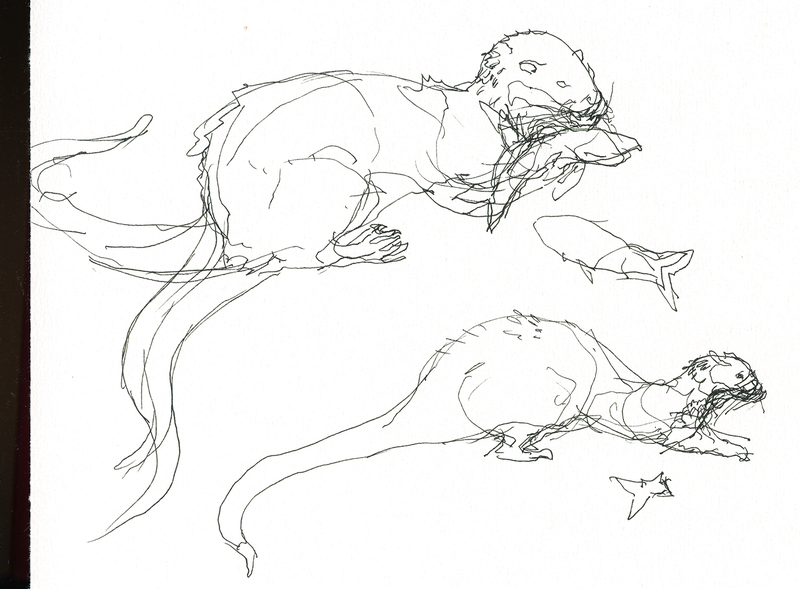 Interesting to note how the otter and the fisher are very similar in build – but the fisher – being a forest creature, has a light fluffy tail (like a squirrel) where the otter has a thick, muscular, short-haired tail (almost rat like to be honest). You can see right away the otter is built to swim, with that powerful tail being the outboard motor, where the fisher climbs and leaps through the trees, using the tail for balance. It’s always fascinating to me when I figure something out just by drawing. The whole process of being observant is – (ha ha) – kind of eye-opening. 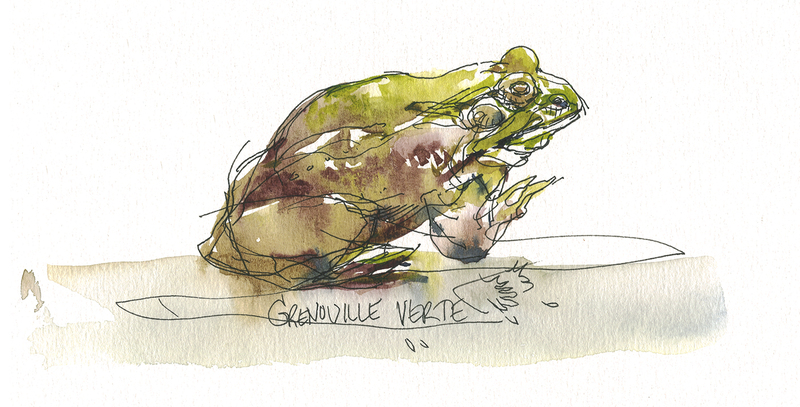 So, lets end the Ecomuseum with the green frog. I don’t know why, but there’s an old fashioned epithet where they call French people Frogs. My understanding is it has to do with eating frogs? Which personally, I wouldn’t consider that an insult – I love frog legs. I had some great ones in Cambodia, the size of chicken legs. Delicious! But I suppose people are able to make anything into a slur, just by the way they say it. I wish someone would call me a frog – I’ve finally got my bonjour to be good enough that people here in Montreal talk French to me. Here’s a few more animals from life – these remaining ones from the Granby Zoo. It was weird to be at these two places (though, not in the same day – they’re nowhere near each other). The Ecomuseum only houses animals from Quebec. There’s a quality of life rationale – that their living conditions are as identical as possible to a natural space. And that the climate is right for them by default. (Eg, no African elephants standing knee deep in snow). I also believe their animals are rescues or second generation thereof, and can’t be released back into the wild for various reasons. The Granby Zoo on the other hand is full on razzle dazzle. Alligators and tigers and colorful tropical birds. There’s a weird Jurassic Park slash King Kong vibe all over the place – huge plastic logs and fiberglass bamboo signs. Trying for a safari feel I suppose? I mean, the place is attached to a waterpark called ‘Amazoo ‘- which I had zero interest in checking out. Zip down the Anaconda Slide, stop by the Tiki Dog stand! Well, I was tempted by the Bear Paw hut. A significant portion of the Granby zoo was set aside for an exhibit of anamatronic (robot) dinosaurs. They made a terrific racket fake-roaring and fake-screeching on loud speakers. A: it seemed like a huge cash grab to get the kids in to see these mechanical leaping lizards and B: it has to be stressful for the real animals hearing these mega predators bellowing from sun up to sun down. I know it was bugging the hell out of me. It’s a bit hard to take it seriously as a zoological institution. You’re left with the simple feeling that it’s a cynical for-profit business crammed full of unfortunate creatures. So, I dunno what to do about all that. I want to think I can enjoy an afternoon drawing animals. But I’m not sure if I should be giving these sideshow operators my money. It feels cleaner somehow to draw taxidermy animals at the Redpath. Sure they were killed for a museum some time in the last century. But at least the critter goes on to a peaceful afterlife working for science. I think the argument in favor is, a properly cared for taxidermy mount will last forever. So, we’ll see how much more zoo drawing I end up doing. I’d be quite willing to donate myself to the plastination people if you want to draw my corpse in a museum! Possibly that will make up for some karmic debt. thank you for inspiring me to sketch EVERYWHERE! this past summer on a trip to the zoo i did just that and, although i didn’t think it possible, i loved the zoo even more that day! 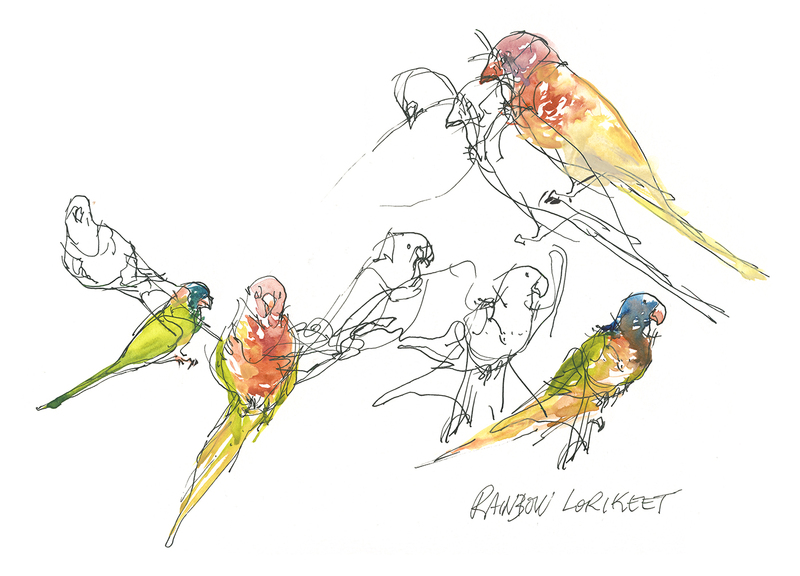 i am realizing that the more i sketch the more i will improve…not every sketch will be a keeper, but keeps me moving! thanks again! Thank you for this adventure in Animal drawing! If you publish a book of your drawings of animals I would like to buy it! Thank you for taking your time to put you drawings and comments on the web. I so enjoy them. You inspire me to do more observing and sketching. You are so right you never really see something until you try to sketch it. Pacing and running in circles. How very sad for these normally free ranging animals. Went to NC Zoo considered to be a great zoo for natural habitat, but still found it a bit depressing. Was looking forward to photographing them for art insiration, but zooming in to those sad eyes zapped my enthusiasm. I understand your conflicted feelings. Another thanks here for posting your sketches and comments. Love, love ink! And some WC with it! The frog is a little masterpiece, OK it would be a big one for me. Your pen/ink, please? I so admire your drawing. It’s so sensitive and alive! Love your perfect touches of paint as well. Really beautiful. I hate zoo’s, they make me profoundly sad. But as usual, I love your blog post and your drawings! i never went to zoos before i had kids. and now i only go when it is free. i am torn between their stance as educational about endangerment issues–and the fact that they keep wild animals in cages. but i do look forward to sketching your corpse. you can sketch mine as it–hopefully–decays in a natural setting. Oh Marc I do miss you and your zany off beat commentary! 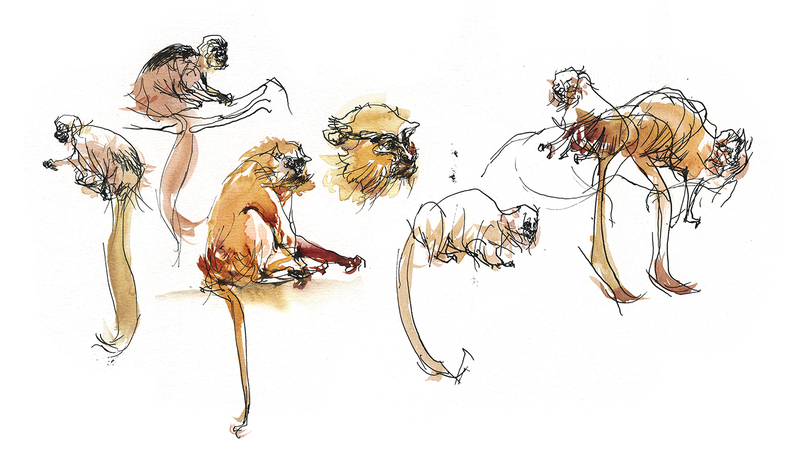 not to mention sketches of moving creatures. I was recently sketching some adorable (and friendly) miniature pigs while in a pen with them and could have used your advise here. After an hour I started to get the hang of them, but almost gave up along the way. Wish we had a zoo in town. Plastination? I had to look that up- intriguing. I always intended to donate my body to something…..
On the monkey sketch, what color red are you using for his arm? Thanks Marc for posting these sketches!